Glorious ridiculousness thrives in Joss Whedon’s Marvel universe, a place so vivid, witty, emotional, exuberantly paced and generally epic that you’re too busy trying to keep up to notice how overpopulated it is. Here’s what matters: the band is back together! But is it a reunion tour or a retirement tour? Iron Man/Tony Stark (Robert Downey, Jr. – duh) looks like he might be ready to hang it up, hoping there is a bigger, better, more certain solution for Earth’s safety. Meanwhile, there’s a romance abloom, and it’s not between Thor (Chris Hemsworth) and Captain America (Chris Evans). Damn it! The mad scientists of the group (Stark and Mark Ruffalo’s Bruce Banner) keep toying with AI, even though their experiments sometimes develop a God-complex and snarky personality (thanks to a wonderfully realized turn from James Spader, who relishes Whedon’s quotation-happy dialog). Spader’s Ultron adopts some freaky twins from another segment of the Marvel universe, there’s a birth of sorts, and more fight sequences, tossed vehicles, imploded buildings, and general chaos than can safely fit on a normal sized screen. That’s why they went IMAX, baby. As with its predecessor and the best of the individual Avenger flicks, this adventure is loaded with visual style, but the film is at its best when it lets its characters become personalities. Whedon’s writing is so far superior to that of other superhero scribes – more naturally comedic and rich with opportunities for his cast to create characters – that the film cannot help but entertain. And beyond the funny one-liners, this Avengers explores some dark corners to undercover questionable moralities. Still, there is a lot of icing on this cake. 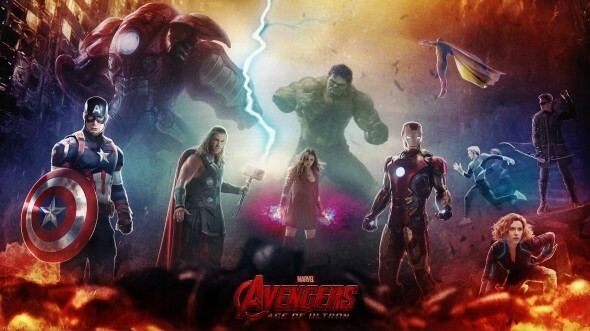 The film throws extra screen time and added layers toward some of the less-appreciated Avengers, nearly doubles the size of the team, and throws in so many super hero cameos it feels less like Age of Ultron and more like Avengers and Friends. There is so much going on that, to a certain degree, not much happens. It’s huge, fast, colorful and fun. It’s smartly written and capably, enjoyable performed. It lacks the resonance and visual articulation of Captain America: The Winter Solder, and even when Ultron sings bitterly of Pinocchio, no villain in the Marvel universe has been able to hold a candle to Loki. The thing is, it’s just cool to hang with these guys. Maybe it’s not their best album, but the live show is always fun. Weren’t We Due a Little Something?